GMGRadio’s consumer research department, MediaLab, has spent the last two years gaining a unique insight into mature consumers who we call Highlifers. Through a mixture of quantitative and qualitative research and thousands of individual surveys, we've been able to find out more about the changing lifestyles of the 40+ marketplace. Over 40s are now living the kind of lives that are normally associated with those in their 20s & 30s. Far from slowing down, this is a group of people who are living life to the full – they want new experiences and discoveries and they have the financial means to enable them to do so. More over 40s are either single or divorced than ever before and therefore, either out of need, want or both, they are behaving like 20 somethings to enjoy a varied social life with a view to finding a new relationship and perhaps a new start. The latest published stats show that the figure has risen to 13% - almost double the level of 1991! 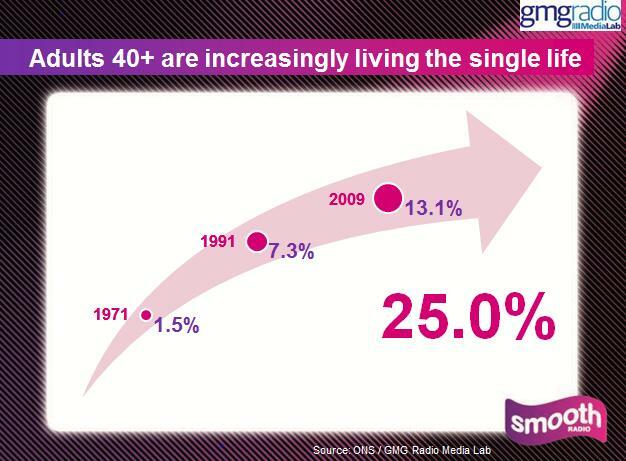 Furtherto this, MediaLab discovered that when combined, 25% of over 40’s are either divorced OR single! This data gives a mathematical and logical explanation for something that is talked about in phrases like ‘40 is the new 30’, but rarely demonstrated in numbers. The reason that over 40s are behaving more like 20 and 30 something’s is partly because more of them now find themselves in the same situation they were in in their 20s and 30’s. This time though, they are more experienced, confident – and better off! An example of this new-found confidence and freedom is expressed in a rather surprising way….. 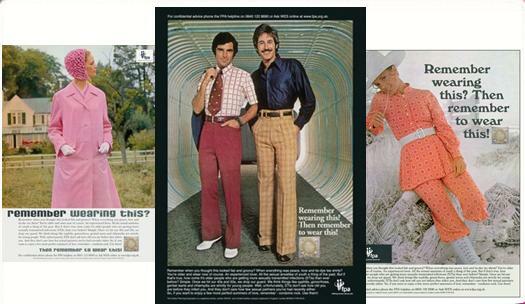 The ads below are not from the 70s but from a recent Family Planning Association campaign to promote condom usage in mature adults. Instances of Sexually Transmitted Infections in mature adults have risen sharply in recent years and this creative work is designed to help tackle the problem and raise awareness. Many over 40s & especially over 50s will have benefitted from inheritance, made money from selling houses, enjoyed a buoyant economy in relative terms and for many of those nearing retirement, a job for life with a secure, worthwhile pension fund. All this means that compared to those in their 20s and 30s, the Highlifers are in better financial shape with lots of opportunity to spend money at the click of a button. Despite this, they are still being sensible. Some are putting off major spends but they are making their money work harder. Price & value for money emerges as a top priority when it comes to making a purchasing decision and this is no different to any other age group in these times. 21% say they are using a cheaper supermarket and 40% have started to buy supermarket's own or value brands to save money. They are making everyday savings that then justify bigger lifestyle purchases. Over half, (52%) are considering holidays with almost half looking at new furniture for example. The recession has made them careful but still prepared to spend on what they feel is important or what they really value. This is an age group who are financially comfortable and this is demonstrated clearly when we look at car buying, the second largest spend after buying your home. MediaLab found that 36% will change their car within the next 12 months, against a national average of just 24%, and over 50s are significantly more likely to own 2 cars. Remarkably, 63% will use money from their savings to buy their next car – showing that they have real money in the bank and while not all mature consumers are the same, the fact remains that statistically this is most financially stable age group in the UK. Incredibly, 2 in 5 see themselves as early adopters – the remainder don’t shy away from it but are quick to take it up when it enters the mainstream. In focus groups, technology usage is described as ‘intuitive’ and absolutely vital to the way Highlifers live their lives today. 77% use social networking sites and Facebook, YouTube and Twitter are the 3 most popular sites amongst over 40s demonstrating healthy social lives and a willingness to actively stay in touch and make new connections with old friends. 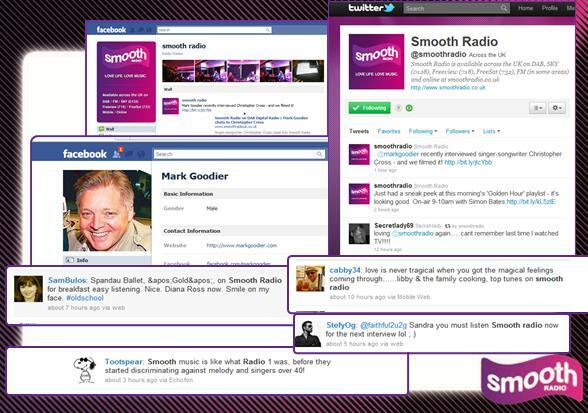 Smooth Radio recently launched smoothradiodating.co.uk which has been a huge success for the brand, further substantiating our findings on the changing lifestyles of mature consumers. Highlifers control over 80 per cent of Britain's wealth, mainly due to the huge increases in the value of their homes. They have profited from a range of economic benefits not available to subsequent generations, including generous final salary pension schemes, student grants for both themselves & their children and affordable housing. Interestingly, a report by the insurer Friends Provident found that nearly one in four people over 50 worked for the social contact rather than the money! On an everyday level we’ve found that Highlifers have the same concerns, interests and pastimes as their younger counterparts. They are just as concerned with their appearance and looking good as those in their 20s and 30s. For women, 87% are actively seeking beauty information and 91% say that they trust word of mouth when it comes to beauty products and treatments. 56% say that they would consider cosmetic surgery – although this would be for anti-ageing procedures such as Botox rather than breast enhancement for example. 81% are interested in health and seek information on keeping healthy, but it’s personal appearance rather than health concerns that is motivating them to lead a healthier lifestyle! 40% say that they’re too busy to look after their health, which means they need more help with it. This age group are 41% more likely to use diet drinks and 10% more likely than the average to eat salad in a bid to stay healthy. For Highlifers,the reason they use social networks is to stay in touch, rekindle old friendships or love interests and in essence stay connected with their past, current and future friends and partners. But it’s not all about the virtual world. Our research tells us that they are out there enjoying all the things they always did, never did or used to do years ago and want to do again. Years of children at home can restrict one’s social life but once the kids are older, they have more time to indulge their own passions and interests. This age group goes to gigs, concerts, the theatre and comedy shows. They often eat out and go for drinks before a show and enjoy an active and fulfilling social life. Highlifers are a fascinating and economically essential group of consumers. They can help to optimise a brand’s success but it’s very important to actively engage them as consumers and communicate with them in the right way. MediaLab have conducted extensive research, some of which led to us publishing the Regenesis Theory. We have a great deal to offer advertisers when it comes to thinking about the language and tonality of their campaigns and we would be delighted to share more information with advertisers and their agencies where relevant.